Water supplies in the western regions of the US rely on snow melt from mountainous areas. Snow forms an important part of the hydrological cycle, effectively storing frozen water in the form of snow high up in the mountains over the winter months. As the seasons change and the weather warms, this melting snow provides a water source that recharges groundwater, as well as runoff that increases water volume and flow rate in streams and rivers, topping up reservoirs that store water for use during the dry summer months. But global warming and climate change can disrupt this process. 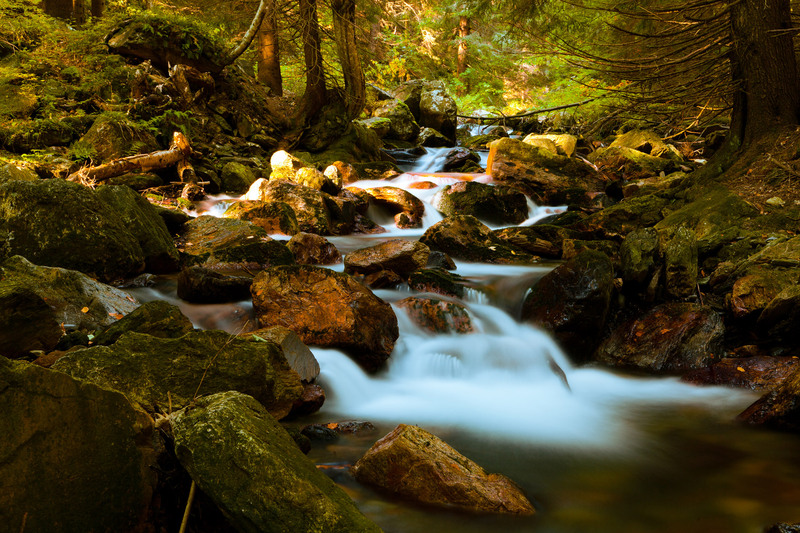 A recent study conducted by a research team comprising of hydrologists simulated isolated effects of climate change on Rocky Mountain streams. Their analysis looked at various types of precipitation (rainfall versus snow) together with the effect of temperature within the system. They discovered that it is more important how water leaves a stream watershed than how it enters the system. Hydrologists very often create water budgets in order to account for the various paths that water can enter and leave the system. For mountain streams, water enters the system as either rain or snow, yet only a small portion exits the system as streamflow. A large percentage of water from snow melt soaks into soils, where it is either taken up by plants or evaporates (collectively known as evapotranspiration). This water can also replenish groundwater and may enter a stream at a later stage. But an important factor in this equation, is whether this precipitation fell as rain or snow. There are two primary ways that mountain streams can be affected by climate change: 1) By increasing the overall temperature within the system, which in turn increases evapotranspiration; and 2) by causing the precipitation to change from snow to rain. Both of these key impacts have the potential to alter the volume of water within a mountain stream watershed considerably, as well as the volume of water that reaches towns and cities further downstream. According to Paul Brooks, a professor at the University of Utah and co-author of the study which was recently published in the scientific journal Environmental Research Letters, it is necessary to separate the influence of these two factors. “As the climate becomes increasingly more variable, we need to provide water resource managers with specific guidance on how individual warm or wet years, which may not coincide, will influence water supply,” said Brooks. For the study, Lauren Foster, a doctoral student at Colorado School of Mines and her fellow researchers, modeled two stream watersheds, simulating the atmospheric conditions experienced in a typical water year, then applying eleven simulations using various alterations in temperature to determine how the watersheds would respond. In a baseline scenario where there was no change in temperature, stream hydrology remained consistent, with a surge in streamflow during periods of snowmelt. As snow melted through spring and into summer, the meltwater from the snow replenished the underground aquifer, which in turn kept the stream flowing through autumn and into winter. However, when the type of precipitation was altered (I.e. Snow changed to rain), the stream flow rate became “flashier”, with water that would normally have been stored in adjacent areas as snow, now flowing directly into the stream as runoff at a much faster rate. This caused the overall streamflow to decrease by 18% in the watershed situated on the western side of the continental divide, and 11% in the watershed situated on the eastern side of the continental divide. However, when the researchers warmed the stream systems up by 4℃ the rate of evapotranspiration increased, which in turn caused streamflow to be supported by groundwater a whole season earlier, starting in summer as apposed to autumn. Streamflow rates were reduced by 23% in the western watersheds and 19% in the east, suggesting that higher temperatures may have a greater impact on streamflow than precipitation changing from snow to rain. “Changes in energy, which result in changes in evapotranspiration, outweighed the changes in the form of precipitation,” said Reed Maxwell of Colorado School of Mines. According to the researchers, the effect of these two key climate change impacts may vary from location to location, and the study results need to be compared with real-world environments. The study does provide insight that helps give us a clearer perspective of water availability in the future, particularly for cities located in the mountainous western states. Tags: Guest Post. Bookmark the permalink. Previous post ← PSM as a Career Option: #4 Will I Regret Choosing PSM if all I Want is a Clinical Branch?